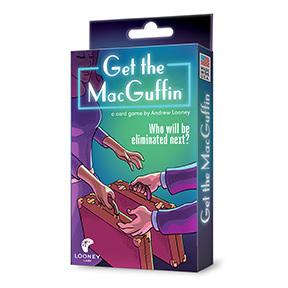 For those of you who don’t know this writer’s term the MacGuffin is an object that everyone wants often times with little or no explanation, examples of this include the Holy Grail, the Briefcase in Pulp Fiction or even the Infinity Stones from the Marvel Universe. With that in mind let’s delve into the game. The game comes in a very small box that fits comfortably in a back pocket. Making it a great game for traveling. The Cards are oversized which is nice. They allow you to clearly identify and read the cards. The art work on the cards are also fit the game very well. I recommend somewhere in the 4-5 range to have a longer and more challenging game. They even included instructions for you to play without a table. This lets families play this game while traveling! I had a lot of fun playing this. The quality of everything is high which you come to expect from Looney Labs. 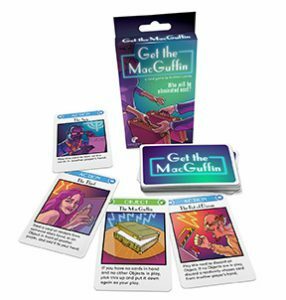 “Get the MacGuffin” belongs in every game collection! PreviouslyCharlie on the M.T.A. 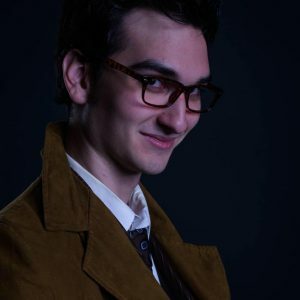 : Did He Ever Return?